A white nationalist who says he pepper-sprayed a demonstrator in self-defense on the campus of the University of Virginia was denied bond at a court hearing Thursday. Christopher Cantwell of Keene, New Hampshire, was taken into custody at the police department in Lynchburg, Virginia. He was transported from a regional jail in Lynchburg to the Albemarle-Charlottesville Regional Jail in Charlottesville Thursday, where he will remain in custody. His next court appearance is scheduled for Oct. 12, according to court officials. Laywer information for Cantwell was not immediately available. Cantwell faces three felony charges: two counts of the illegal use of tear gas or other gases and one count of malicious bodily injury with a "caustic substance," explosive or fire. 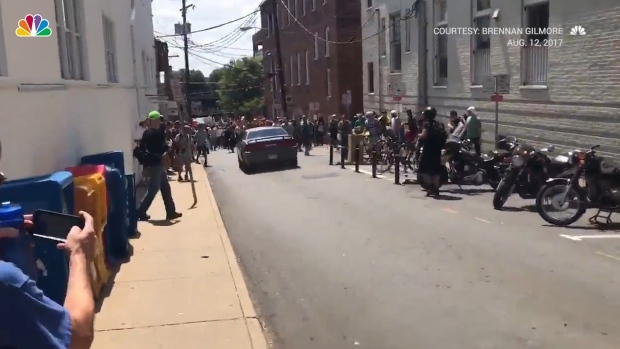 Footage shows a vehicle appear to drive into a group of counter-protesters in Charlottesville, Virginia. Clashes between white nationalists and counter protesters had been ongoing on Aug. 12. Contacted Tuesday by The Associated Press, Cantwell acknowledged he had pepper-sprayed a counter demonstrator during an Aug. 11 protest, a day before a deadly demonstration in Charlottesville. He insisted he was defending himself, saying he did it "because my only other option was knocking out his teeth." He said he looked forward to his day in court.